The bus did not go directly to Palm Beach. Indeed, if it had, it would have been a short trip as the beach is not all that far from the cruise terminal. Therefore, the bus took us to some of the island's tourist attractions first. We began by heading inland. 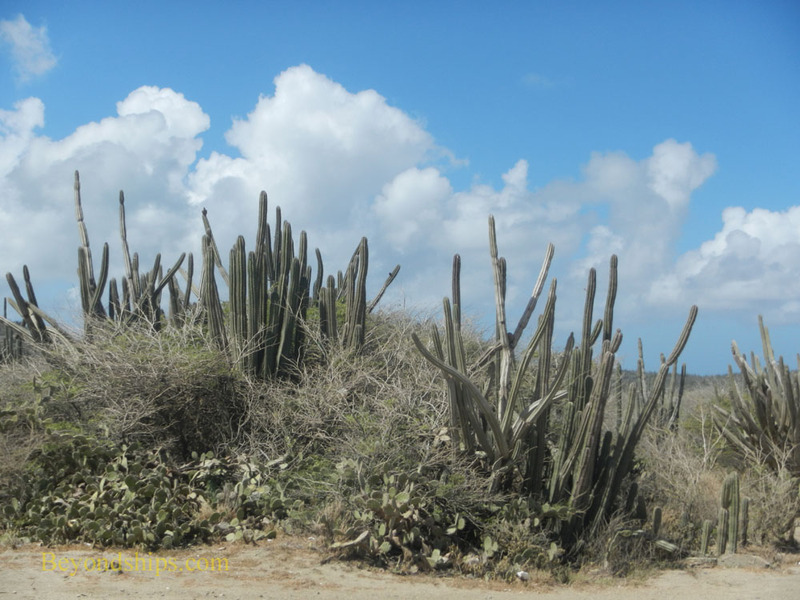 Aruba is a desert island and its interior is mostly barren except for cactus. It is a wonder that some movie company has not used it as the set for a Western. Our objective was the Alto Vista Chapel. With its bright yellow walls and red tile roof, the chapel stands out from the surrounding desert. 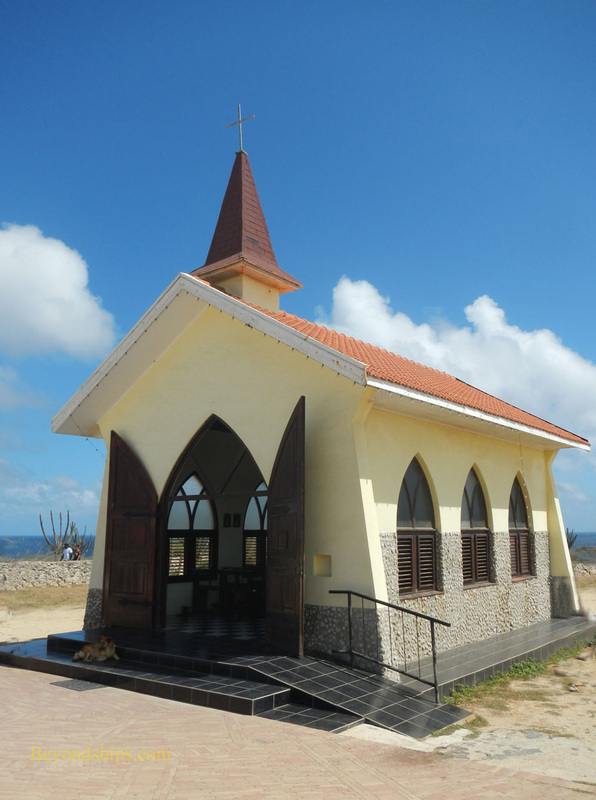 Built on the site of the first Catholic church in Aruba, the Alto Vista Chapel is still a pilgrimage church. It is quite tiny but the large doors open out so that worshipers sitting outside in the semi-circular pews in front of the church can participate. Because of its size, it does not take long to explore the chapel. However, the passengers made purchases from various vendors and used the relief facilities. Several other tours of various types came and went while we were there. The next stop was the California Lighthouse at the northern tip of the island. To get there, we traveled by some of the luxury resort communities that have been built on Aruba recently. 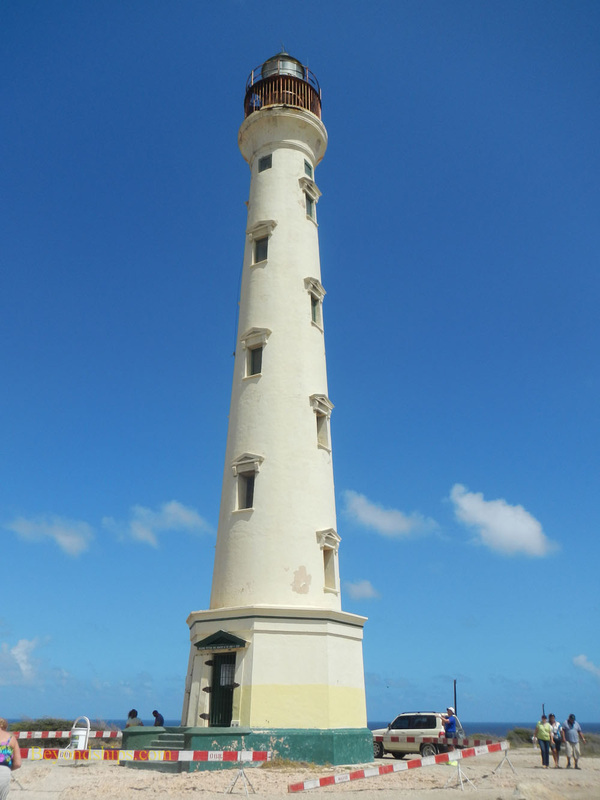 Built in 1910, the lighthouse towers over the desert plateau that it is atop. You cannot go into the lighthouse itself but you do get a good view of the northern part of the island from the plateau. Leaving the lighthouse, our bus encountered another Kukoo Kunuku bus. This necessitated a shouting contest to determine which bus was having the better time. Both buses participated enthusiastically.